Cleaning up after a basement flood is never easy. You can spend hours or days pumping, mopping, bleaching, and filling your trash cans. Even when you think it’s over, water can still be causing damage. 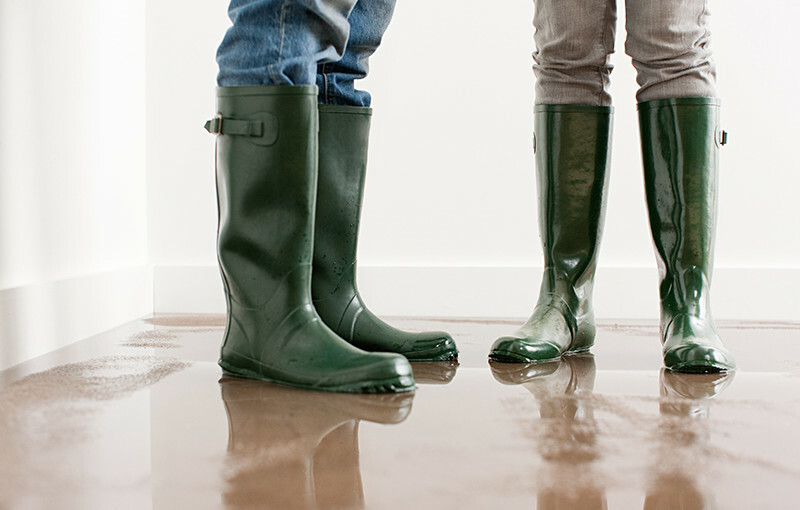 After a flood, your basement needs to be checked for water seepage, cracked foundation, and visible damage. If your basement is not properly cleaned and repaired after a flood, the money you save now is inconsequential compared to these three long-term costs you could face in the months and years to come. If there is a good side to basement flooding, it may be that it gives you the jumpstart you need to finally clean the basement. Unfortunately, you’re probably in for a lot more cleaning and purging than you anticipated. Besides the items which are an obvious loss, even items which you thought were untouched by the flood may be damaged. Let’s say you used plastic storage containers to organize your basement; in most circumstances, they provide excellent protection for your possessions. But if there were even a hairline crack in the container, it would be enough to let water get in and damage the contents. Not only that, it takes a while for basement humidity levels to normalize after a flood. During that time, paper and fabric items stored in the containers can soak up moisture from the air and become a breeding ground for mold. Your best course of action is to remove everything from these containers and let them completely air dry. Drying the contents outdoors can speed the process, but keep the items out of the sun to prevent fading. Cleaning the walls and floors of your basement are critical, and having them cleaned by professionals could mean the difference between a small cleaning fee and the cost of major structural repairs down the road. On rare occasions, basement carpeting can be saved if it’s immediately cleaned by professionals and thoroughly dried. But this is only the case if the damage has been caused by “sanitary flooding” or flooding caused by clean water, for example, a leaky water pipe. Even then, the cleanup should be done within 12 hours of the flood and followed immediately with a drying process that includes multiple fans and humidifiers. Unsanitary flooding (from rainwater, for instance) or black-water flooding from raw sewage contaminates carpeting making it unsalvageable. Wood floors (solid or those with plywood backing) will often be unusable as well after floodwaters cause them to swell and buckle. Basement drywall and paneling are easily damaged by basement flooding. If they’re not removed during cleanup, they MUST be disinfected (bleach is preferred) and completely dried to prevent mold growth. If the basement area remains humid following a flood, it could lead to serious structural damage from dry rot. Dry rot is a term used to describe a particular kind of dry, cracking, rotting wood. It’s the product of a variety of fungus that thrives in semi-moist conditions. Dry rot doesn’t limit itself to wood, either; it can grow through damp mortar, concrete, masonry, and plaster. You’ll need an experienced electrician and HVAC technician to assess the damage and perform repairs. Finally, you may not realize the true long-term damage caused to your house until years later when you try to sell it. Real estate laws differ from state to state, but almost every state requires the seller to disclose damage caused by a flood. If your basement was damaged by flooding and you can’t document complete cleanup and repairs, that could be a big “red flag” for prospective home buyers. Beyond an unpleasant smell, a moldy basement can lead to very serious health issues. Prolonged exposure to indoor molds such as those found in a basement may lead to upper respiratory tract infections such as coughs, wheezing, and asthma symptoms, especially in people who have allergies. It can also cause fungal infections in people with compromised immune systems, including those recovering from cancer or those who have artificial joints or heart replacement valves. Some types of molds – most notably “black mold” – can cause serious bleeding inside your lungs, resulting in damage to other organs as well. The long-term costs of water damage in the home can easily increase to thousands of dollars. Not only that, it can damage something truly priceless – your health. If you’re concerned about the possibility of water damage in your basement, Team EverDry is here to help! Contact us online or give us a call at (419) 841-6055 to schedule a free 20-point basement inspection!